Watch the video, then join the campaign to put kids first! San Antonio is a vibrant community, with a rich cultural heritage, and an amazing place to call home. Good things are happening in classrooms across our city. New schools are being created. Innovative school models, like district-charter partnerships, are emerging. Parents have more options and more choices than ever before. At Families Empowered, we work to connect parents to the schools that are right for them, because we believe every child – no matter their zip code – deserves access to a great school. We believe, at our core, that we need to cut through the noise to ensure that the needs of kids and families should come first. 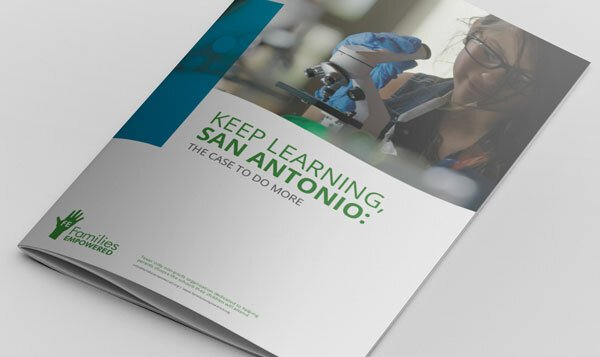 In San Antonio schools, we’re making strides – but we have more to do. We need to continue to bring change in educational policymaking, and we need to keep moving forward into the future, so classrooms across the city can keep nurturing the curiosity that is innate in all of our kids. The more we innovate on educational policy, the more dynamic our schools will be. That’s why we need to keep changing, continue to try new things, and give our kids the 21st century skills they need in changing world. San Antonio needs to keep moving forward, so that nothing holds our kids back. Demand for more options for San Antonio families is high; read Families Empowered’s latest report. Demand for more options for San Antonio families is high; read Families Empowered's latest report. Cuando adoptamos nuevas formas de aprender, nuestros hijos progresan. Sigamos adelante San Antonio. Read Fox29's coverage of Families Empowered's report on charter school demand, Keep Learning, San Antonio. Join the campaign to put kids first. YOU HAVE A VOICE IN THE CHOICE! Get school news from your city delivered to your inbox.